The performance and reliability of these extraordinary guns is the result of the quality of materials used, individual craftsmanship and the precision of the manufacturing processes. Barrels are constructed of cold-forged Boehler Antinit steel, ensuring perfect alignment of the tubes, exceptional strength and long-lasting corrosion resistance. They are carefully tested and checked for ballistic performance and shot pattern. To minimize locking stress while shooting, the "cross-bolt" locking system operates on Monobloc lugs positioned at the height of the upper tube axis. Locking shoulders are replaceable. The low-profile action body is exceptionally sleek to enhance swing and pointability in the heat of competition. The true sidelock design is simple and reliable, renowned for its extremely quick lock times and ultra-crisp trigger pull. Competition pistol grip stock and fore-end feature left- or right-hand palm swells and are crafted from carefully selected, highly figured walnut. They can be sized and dimensioned to the shooter's individual specifications. Each is finished and checkered by hand with the utmost care. The side plates are beautifully hand engraved with a light scroll pattern and finished to Beretta’s extremely high custom standards. The floorplate is embellished with a 24-carat fine gold inlay of the “P. 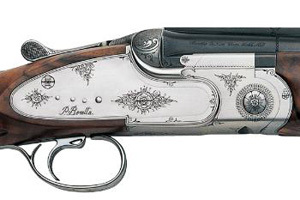 Beretta” signature on the coin silver finish. The gun comes complete with fitted carrying case and a set of maintenance tools. Details such as the knurled trigger provide an extra edge.